This one is for all you shoppers and movie lovers… where to find those hard-to-find movies in Bangkok. In the old days, everyone used to just rent pirated video tapes in Bangkok. It only cost between 10 and 20 baht, you had the movie for a week and they even delivered your order on motorbike. If you liked the movie, you could then pay the rental place a small extra fee (pretty much the cost of a VHS cassette) to make you a copy. Of course, TVs were smaller screened back then and so quality wasn’t a huge issue. In fact, in the 1980s, I can’t think of any places in Bangkok that sold genuine, non-pirated VHS tapes, other than the US commissary. From the start of the 2000s, Bangkok became a major destination for pirate dvds and once bluray came out, for pirate bluray discs. However, at the same time, genuine dvd stores were building up a strong presence as well. Stores like Mangpong (translated as Scorpion), GMM (Grammy) and Boomerang, who in the 1980s specialised in Thai music (on cassette), started expanding their store line to include genuine dvds and blurays, offering a foreign selection in addition to their Thai line-up. Interestingly, the cost of many of the movies sold at these stores was (and is) often less than the cost of the pirate movies for sale in the tourist areas. Interestingly, the unscrupulous conduct of the Thai pirate industry is, in my opinion, the reason for their demise. The number of times that I purchased movies from a pirate seller, only to discover that the quality was lacking (eg a cam version when the seller promised that it wasn’t) or else part of the movie is unplayable (or sometimes the entire disc is unplayable). In some tourist areas, Westerners have even been beaten up by pirate sellers when they complain and try and get a refund. Pirate movie sellers are still around, but I haven’t noticed anywhere near as many as there were several years ago. The fact that you can download movies fairly easily off the internet is another big reason for the pirates’ demise given that you can kind of vet quality based on comments of other downloaders. However, today we live in the world of high definition movies and high definition home theatres. I love movies, and even have a dedicated home theatre with cinema quality high definition projector and 100″ screen. Trying to watch a pirate or downloaded movie on my set-up is truly painful. Low resolution, compression artifacts, poor sound quality and lack of true surround sound becomes painful to watch. Even on a good 40 or 50″ home setup, most downloaded or pirated movies are obvious. As a result, I tend to prefer genuine movies. For older movies (or Thai movies that aren’t available on bluray) I will put up with DVD (as long as its dual layer). For newer movies (particularly, action or sci-fi) where I know I want to watch it on a big screen, I will pay extra for bluray. Many of you will say that, for movies only on DVD, the pirate copy would be fine… however, my experience has been that most pirate copies (even though advertised as being DVD9, ie dual layer) tend to only be single layer (ie 4.5gb instead of 9gb). This is because dual layer discs cost more to stamp (and avoid “burned” discs because over time the ink de-laminates, particulary towards the end of the movie). So… where to buy genuine movies in Bangkok? Okay, I have spent a bit of space venting about my dislike over the movie piracy industry in Thailand… however, they have pissed me off big time over the years. Anyway, on to the main point of the story… where do you find movies genuine, decent quality, movies in Bangkok? GMM (Grammy) – GMM is the largest music producing company in Thailand. Most Thai music that you hear playing around Thailand is signed up to this label (or one of their spin-off specialty labels). They have a few stores (although fewer than before) scattered around town that sells, in addition to music, dvds and some blurays. Their movie mix includes an excellent collection of Thai movies (GMM has produced some really good quality Thai movies; although the dvds rarely have English subtitles), as well as a bunch of hollywood films. In addition, they tend to have a bunch of b-grade Western films… films that you would struggle to find at stores in the West. Pricing for dvds is often quite low, and keep an eye out on sales. I once picked up the entire Critters collection, paying only 89 baht per disc. GMM’s stores are on the decline (probably due to competitors offering bigger ranges), and I can’t find anything online giving full listings of which stores are left. However, the only store that I have still seen open, is in Siam Paragon (I forgot which floor, but once you find yourself near the upper end hifi stores and electric guitar stores then you are very close). There is also a store in Central World (level 1). Boomerang – These guys have branched out all over the place and you will find a Boomerang store located in most major shopping centres. They sell the same sort of movies as GMM, but they aren’t tied to any particular brand. They also have a pretty decent bluray collection (including the more popular tv shows on bluray). However, keep in mind that blurays tend to be imported into Thailand, and therefore tend to be really expensive compared to prices in the West. I also find the staff at these stores tend to be pretty hip and have a good sense of humour (ie they are movie and music lovers and happy to chat about their favourites). Most shopping centres that have a Central Department store will usually also have a Boomerang outlet located in the shopping centre (but not in Central Department store and not in Central Chitlom). This includes Central World (level 4), and Silom Complex. In addition, the outlets of “The Mall” each have a store, as does Terminal 21 (basement), Emporium and Siam Discovery. 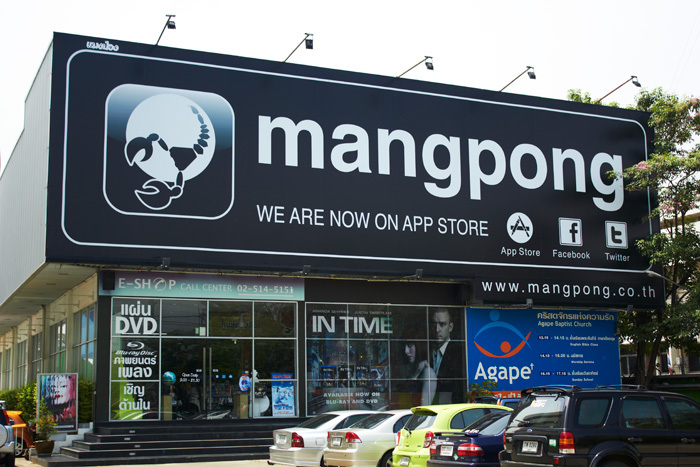 Mangpong (Scorpion) – This company started out early as a dedicated movie and music retailer in 1989. Today, I consider them to be the second best movie store in Bangkok. They have an awesome collection of movies in both DVD and bluray. In addition, if you like music, then this is the place to go (including for vinyl). In addition, they have a mega-store along Lard Prao Road (a bit out of the way for most people, as its around Soi 90; after the Raminthra overpass) which is quite trendy and often has special events. 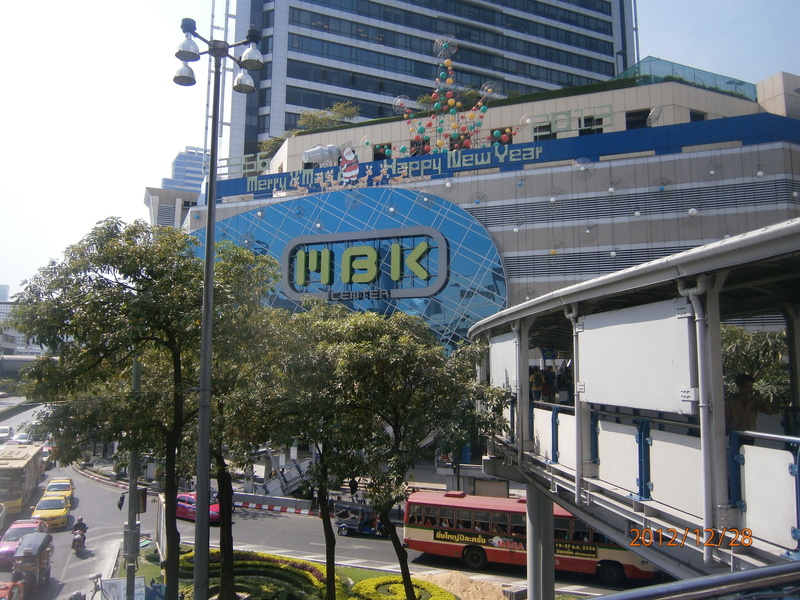 As with Boomerang, Mangpong has a lot of stores around in most popular shopping centres, including most shopping centres that have a Central department store in it (once again, not within the department store section, but in the main shopping centre), as well as: MBK, Central World (level 1), Siam Paragon (lvls 2 and 3), and Emporium (level 4). Now the best for last… this is a smaller chain than any of the others, but in my opinion, they really do have the biggest selection of movies (including hard to find movies that tend to be out of distribution in the West)…. drum roll please… the winner is Cap Music. Notwithstanding their name, they sell movies as well as music (and they even have a decent vinyl collection of music). They also tend to be the cheapest store on average. To give you an idea on pricing, I managed to pick up the bluray box collection of The Matrix on sale for 900 baht (individual blurays are typically 1,800 to 800 baht). Their main location is level 4 of Central World, but they also recently opened up their newest store in The Gateway, Ekamai. If you still aren’t able to find what you are after, there is one final option that is worth mentioning. International DVD Empire, also on level 4 of Central World, has hard to find (and new release) DVDs and blurays. However, pricing at this place is very expensive because everything is imported directly by this store (ie in smaller quantities). I didn’t make this point earlier, but some of you may have noticed the pattern by now. If you are shopping for movies in Bangkok, there is one shopping centre that offers the biggest selection, given that it houses GMM, Boomerang, Mangpong, CAP and International DVD Empire, all under one roof… Central World. This is where I always go when I am on a movie buying spree. Well, there you have it… another Bangkok secret unveiled. Happy shopping! Pete checks out the grand opening of Pattaya’s newest and largest shopping centre, and gives a detailed account of what you will find in the store. Fortune Town – Possibly the best place in Bangkok for IT, audio visual, DJ gear, camera equipment and model paints.